An old legend talks about the submerged remains of the ancient “Chiozza”, sunk off the coast of Chioggia in the Adriatic Sea. A kind of Adriatic Atlantis whose old bell towers, massive walls held and seriously tore fishing nets. The dialectal name “Tegnùe” means held and it indicates this wide zone off the Northern Italian Adriatic coast, where fascinating subtidal rocks hold fishing nets. Tegnùe are biogenetic carbonate rocks, built by marine organisms, usually superimposed on earlier hard substrata formed by the consolidation of sand. 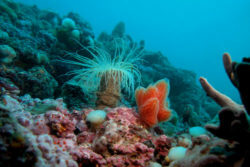 In fact, they are genuine natural reefs, evolved over the past 3000-4000 years. They differ from tropical reefs, because the main building organisms are not corals here, but red calcareous algae, called “Coralline”. They are often called the “Adriatic Coral Reef”. The presence of these submerged rocks has been known since the 18th century, as recorded in the writings of Abbot Giuseppe Olivi, Chioggia naturalist that first described them. These subtidal rocks may be found in all the Northern Adriatic Sea, but the ones off the coast of Chioggia are the widest and most important complex, where until now the most extended clusters are present. Divers can admire the high biodiversity of species inhabiting the Tegnùe environment. There are either fauna organisms or sessile vegetables (immobile organisms), both are very eye-catching and colourful. 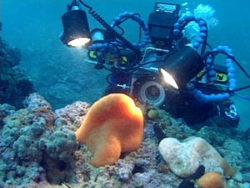 For example, there are sponges, sea anemones, ascidians and many fish species. On 5 August 2002 the area of the Tegnùe of Chioggia was declared an area of biological protection. Since 2011 they became a Site of Community Interest. The Tegnùe are a unique environment in the Northern Adriatic Sea, but still very little known. This protected area has been promoted by the town of Chioggia and thanks to the “Tegnùe Association” it was mapped and enhanced. Only through a proper dissemination and education to environmental protection and respect, the unique and rare environment of the Tegnùe will be safeguarded and preserved.